On a sunny corner behind Zizzi’s and across from Starbucks, The Meal Ticket is relatively small. Long and thin, with immensely high ceilings, it’s effectively split into two, counter and seating in the left-hand side, with the door and till on the right. However, when the weather is good, the doors/windows are often opened up, so you can enter from the front or the left, in which case just make your way down to the far end to order. Coming in through the door, the reception for the gym is to your right, with the stairs down to the basement directly ahead. The Meal Ticket, meanwhile, is off to your left, with the till at the back to the left of the stairs. You order here, with a handy flowchart menu for the drinks on the back wall. You can also pick up a sandwich or help yourself from a small selection of cakes. Once you’ve ordered, you’re handed a number (which I kept leaving behind) and directed to take a seat. There are three tables outside on the broad pavement of Sheldon Square, with two massive French windows behind them. These can be opened independently, as can the door/window at the far end, joining the interior with the outside seating. A row of three four-person tables runs along the windows at the front, while the counter is behind that, occupying about three quarters of the back wall, leaving just enough space along the left-hand side for two high tables, a four-person one at the front, a six-person one at the back. And that’s it for seating. The Faema F71 espresso machine takes pride of place to the right of the counter, while the flask for the batch-brew filter is on the left. There’s another selection of cake here, while behind that, along the left of the counter, is the salad bar, which is supplemented by a small brunch menu, served until two o’clock, featuring the usual variations of eggs and toast. When it comes to coffee, The Meal Ticket uses Caravan, with the ubiquitous Market Blend on espresso. I began, on my first day, with an excellent takeaway flat white in my Therma Cup, which was good enough to see me return on the Tuesday for an espresso. It’s been a long time since I’ve had the Market Blend on its own and I was rewarded with a very fine, fruity espresso. 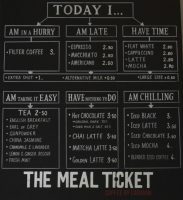 If you don’t fancy espresso, The Meal Ticket has batch-brew, with a range of single-origins, the particular option changing daily. During the week that I was there, the choices were from the Caravan Niners Series, with Nos. 4, 6 and 8 on offer. I popped in on Wednesday to try No. 4, the Bumbogo, a washed Burundi, and returned one last time the next day for the No. 8, another washed coffee, this time the El Fénix from Colombia. The Colombian had an interesting taste and while I liked it, I wouldn’t say I was a huge fan, although it really mellowed as it cooled. Overall, I much preferred the Burundi, but didn’t actually think to make any notes, so can’t say much more! This entry was posted in Breakfast, Cafes, Cake, Coffee Terraces, Laptop Friendly, Lunch, Sandwiches, Stations Nearby, West London and tagged Caravan, include by Brian Williams. Bookmark the permalink.